Here is part of the herd that Lee feeds each morning. We had to wait for them to cross over the road before heading off to drop our absentee ballots off at the voting center. We pretend we are not here so as to avoid the crowds….at least we are hoping there are crowds this year. 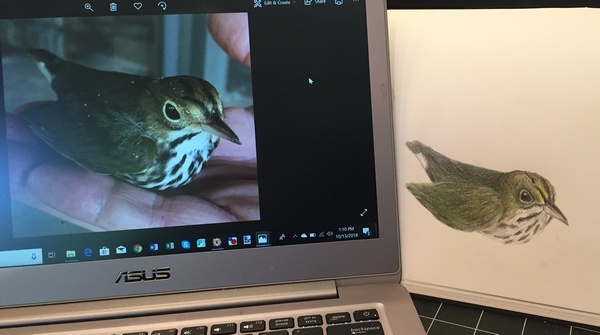 In the studio I attempted to draw the ovenbird. 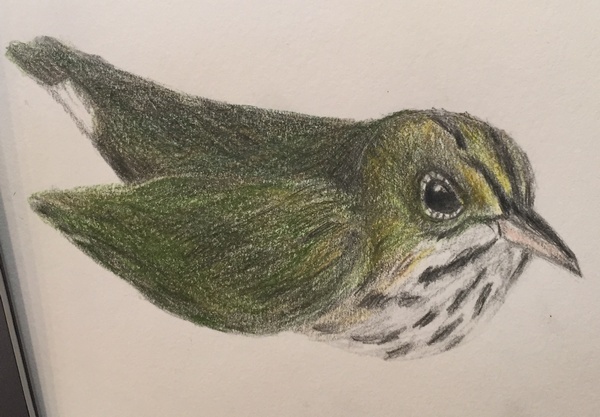 This time in graphite and colored pencil. I am not good with colored pencils. They seem too soft, too mushy on the paper….and the colors are really terrible. You need to do so much blending to get anything near the right color and then they are even mushier. See what I mean? There is no way I can get the blackness of this bird’s eye. I think that colored pencils should be used for soft rose petals or chenille bedspreads and nothing else. And since I have no roses or a bedspread like that, I put them back in their boxes and will stay with the mechanical pencil, eraser (another thing you can’t do with colored pencils is ERASE!) and a bit of watercolor if I am doing birds…..or anything for that matter. But on to other things. I am still doing some ideas for books that are all about the stitch. I found an old picture book of Australia. One I just collected and glanced through. 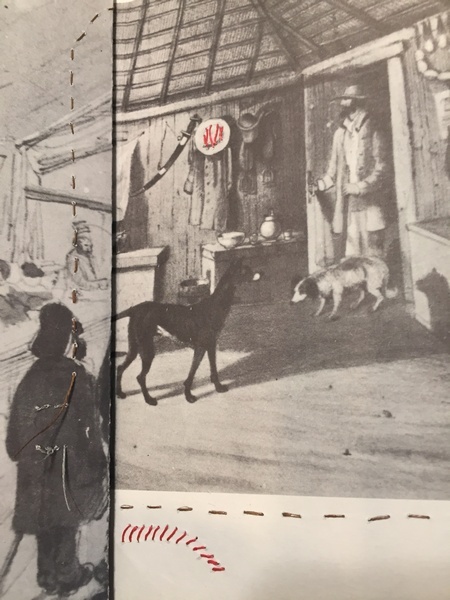 All the illustrations with very little text are black and white old drawings, etc. 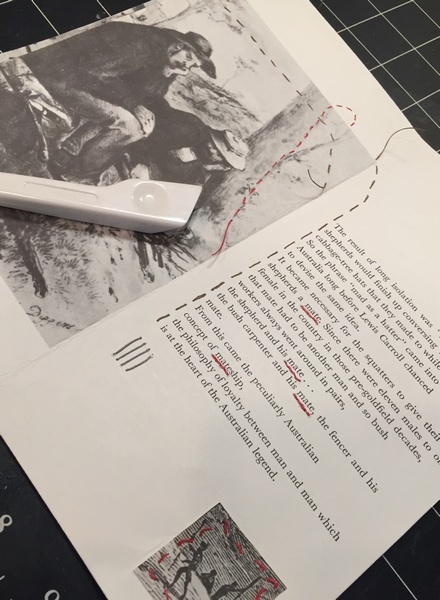 So I trimmed the sheets after carefully clipping the sewing threads to remove folios. Now here I am beginning to stitch with threads I can only get in Australia. It is a unwaxed linen by Guttermann. 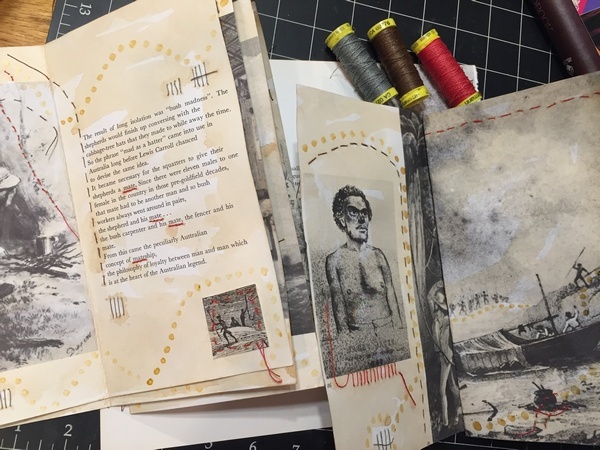 It was fun to pull out just a few folios and then arrange the sized sheets into a bit of story. With so few words, the book was much more about the illustrations. But the whole book was so “Aussie” and the roughness of those who settled there. I loved this page about the loneliness of shepherds, etc who needed a mate to spend time with. The ratio at the time was eleven men to one woman so the land owners would send them off with a mate. And according to this interpretation, that is where the common expression of “mates” in Australia originated. The tool I am pressing down the stitching with after the design is made is a sewing tool that Jane Nicolas gave me. It is very handy for pressing folds in cloth as was its original intention but also good for pressing threads into paper and closing up the holes. The images are very mid 1800s. Lots of tough, “sinewy” manly explorers. Even my favorites, Burke and Wills get some notice. This morning I cooked up some Australia black tea that comes in a canvas bag from down under. After shellacking dots on the pages, I stained them with some tea. So far there are only three signatures of two folios done to this point and I am not sure if I am through surface designing or sewing yet. 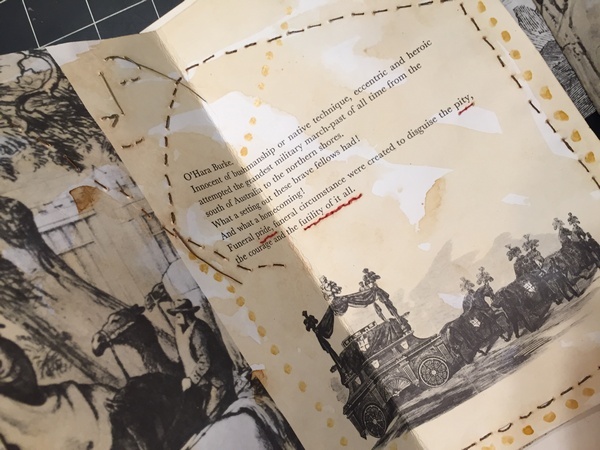 But at least it is something to show students on sewing into the paper, illustration and text. These pages after folded in the center and cut down are about 4.5 x 8 inches. 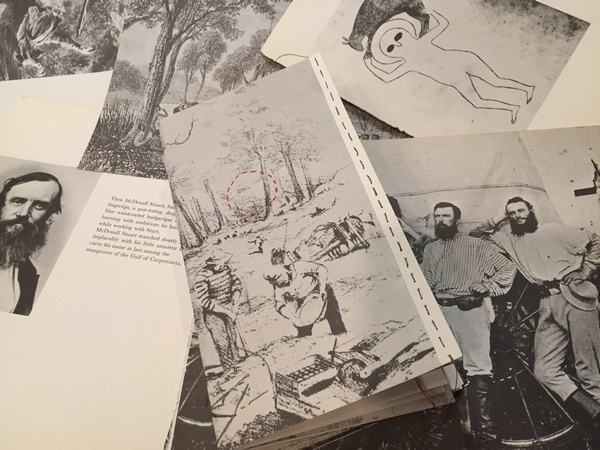 The original book is about 9 x 10 inches in size. There are loads more to choose from. Not sure what next to do with them but for now will catch up the other four signatures to this same point and take a good look and where it wants to go next.